Dr. Charles Richard Drew was born in Washington D.C, on June 3,1904. He was the eldest of five (5) children of Richard and Nora Drew. Dr. Drew was an American medical doctor and surgeon who formulated the idea of a blood bank. [A blood bank is a place for storing blood and/or it components (e.g. blood plasma) for later use in times of emergencies and crises - e.g. accidents, wars and emergency surgeries. The engine of a blood bank is its donors, who give blood to the bank, for later use during blood transfusions. (Blood transfusions allow the transfer of blood from one human being's circulatory system to that of another)]. Dr. Drew is said to have excelled at both academics and sports. 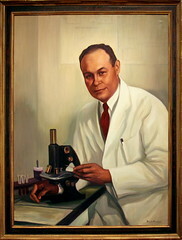 According to article, "Famous Black inventors - Dr. Charles Drew ", after becoming a doctor and working as a college instructor, Dr. Drew went to Columbia University to do his Ph.D. on blood storage. He completed his thesis, entitled, Banked Blood that invented a method of separating and storing plasma, allowing it to be dehydrated for later use. (It was in preparing this thesis, that he discovered that blood plasma stored longer than actual blood). According to article, "Dr. Charles Richard Drew: American Inventor", "Dr. Drew's discoveries are said to have revolutionized the medical profession and saved many lives. He became the first director for the blood bank at the Presbyterian Hospital in New York City, NY, which was the model for the Red Cross's own blood bank. He later resigned that post, when the US War Department issued a directive stating that the bloods of whites and blacks should not be mixed". (At this period in history, segregation was the norm in the USA, but was more prevalent in the Southern United States). Dr. Drew's opinion was that although people have different blood groupings, human beings are human beings and the blood of a white person is the same as the blood of a black person. Ironically, Dr. Drew died (on April 1,1950), from injuries sustained in a car accident in North Carolina, wherein which he and fellow doctors were involved. It is said that although his fellow doctors (who had less severe injuries), tried to resuscitate him, his internal injuries were too extensive for them to successfully do so. Legend has it that he died because the nearest hospital (to which he was taken), was a "whites only" hospital and he was denied access to medical care and blood transfusion from its blood bank, that would have saved his life. His work with the blood bank there, was instrumental in World War II (1939-1945) , where blood transfusions from the Army's blood bank, were performed on injured soldiers. (I would like to thank cliff1066 for the use of his Flickr inset photo of a portrait of Dr. Charles Richard Drew). 6) Article, "History of Segregation in America", by Chris Jones, via Yahoo's AssociatedContent.com, July 31,2007.